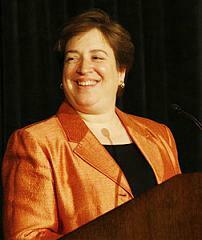 President Barack Obama has chosen Elena Kagan to fill the vacancy left by Justice John Paul Stevens’ retirement. Sadly, Kagan cannot fill Justice Stevens’ mighty shoes. The founders wrote checks and balances into the Constitution so that no one branch would become too powerful. But during his “war on terror,” President George W. Bush claimed nearly unbridled executive power to hold non-citizens indefinitely without an opportunity to challenge their detention and to deny them due process. Three times, a closely divided Supreme Court put on the brakes. Justice Stevens played a critical role in each of those decisions. He wrote the opinions in Rasul v. Bush and Hamdan v. Rumsfeld and his fingerprints were all over Boumediene v. Bush. Unfortunately, President Barack Obama has continued to assert many of Bush’s executive policies in his “war on terror.” Elena Kagan, Obama’s choice to replace Justice Stevens, has never been a judge. But she has been a loyal foot soldier in Obama’s fight against terrorism and there is little reason to believe that she will not continue to do so. During her confirmation hearing for solicitor general, Kagan agreed with Senator Lindsey Graham that the president can hold suspected terrorists indefinitely during wartime, and the entire world is a battlefield. While Bush was shredding the Constitution with his unprecedented assertions of executive power, law professors throughout the country voiced strong objections. Kagan remained silent. Obama had a golden opportunity to appoint a giant of a justice who could take on the extreme right-wingers on the Court who rule consistently against equality and for corporate power. When he cast a vote against the confirmation of John Roberts to be Chief Justice, Senator Obama said, “he has far more often used his formidable skills on behalf of the strong and in opposition to the weak.” Justice Stevens has done just the opposite. If he wanted to choose a non-judge, Obama could have picked Harold Hongju Koh or Erwin Chemerinsky, both brilliant and courageous legal scholars who champion human rights and civil rights over corporate and executive power. Unlike Kagan, whose 20 years as a law professor produced a paucity of legal scholarship, Koh and Chemerinsky both have a formidable body of work that is widely cited by judges and scholars. But Obama took the cautious route and nominated Kagan, who, like Harriet Miers, has no record of judicial opinions and no formidable legal writings. Since Kagan was handily confirmed as solicitor general, Obama probably thinks her confirmation will go smoothly. After the health care debacle, however, he should know that the right-wingers will not be appeased by this milk toast appointment, but will oppose whomever he nominates. Conservatives decry activist judges – primarily those who act contrary to conservative politics. But the Constitution is a short document and it is up to judges to interpret it. Obama has defensively bought into the right-wing rhetoric, saying recently that during the 1960’s and 1970’s, “liberals were guilty” of the “error” of being activist judges. Rather than celebrating the historic achievements of the Warren Court – and of Justice Stevens – Obama is once again cowering in the face of conservative opposition. Obama should have done the right thing, the courageous thing, and filled Justice Stevens’ seat with someone who can fill his shoes. His nomination of Elena Kagan will move the delicately balanced court to the Right. And that is not the right thing.